Does anyone else find budget planning a little... comforting? About a month ago Matt & I sat down to spend a bit of time working out our finances. We did a lot of assuming and ball-parking figures at the time, but after being on holiday in Scotland over Christmas, it was time to put in the serious numbers (...this part is not so fun). With another big trip to Brazil coming up in February, we really needed to get serious about our spending. As a new freelancer (and working part-time at a restaurant), my income is not yet very reliable, and this has put a lot of pressure on Matt. So I have to say, that having a partner who is willing to support you in life is pretty special. To have someone say that they would rather you keep working on your dreams & goals rather than go work any old 9-5 job just to bring in a little extra cash is beyond incredible. He is pretty amazing. Anyways, that still doesn't really pay the bills though, does it? So back to the spreadsheet. We revised the figures in the budget, tinkered with it all a little, I had a tiny meltdown and then we got a really good handle on things. We got to talk about some of the difficult stuff around money like how I hate feeling like I can't pull in my share and how carrying the financial burden affects Matt's quality of life. But in the end we came out feeling a lot better about where everything is at and with a much clearer picture of what we can expect for the next couple months. No matter what your situation is, I really encourage you to spend a little time getting a handle on your money: make saving for the future a priority, revise where you could cut back a little and if you're in a relationship, get on the same page with your partner. We all know money is a HUGE stressor, and it can be a massive problem in relationships. Being smart with your money also has a big impact on your quality of life. Avoiding debt and living fairly minimally has been a fundamental part of me being able to return to study full-time last year and now pursuing a creative career. For that, I am very thankful. How to get started: just open up excel, in the templates that pop up search 'basic personal budget' and use the pre-entered categories to get you started. One of the ways that we're cutting back a little bit this month, is that I'm going to be cooking on a budget. I thought that since many of you may be feeling a little financially stretched after the holidays, that you may find this helpful as well! 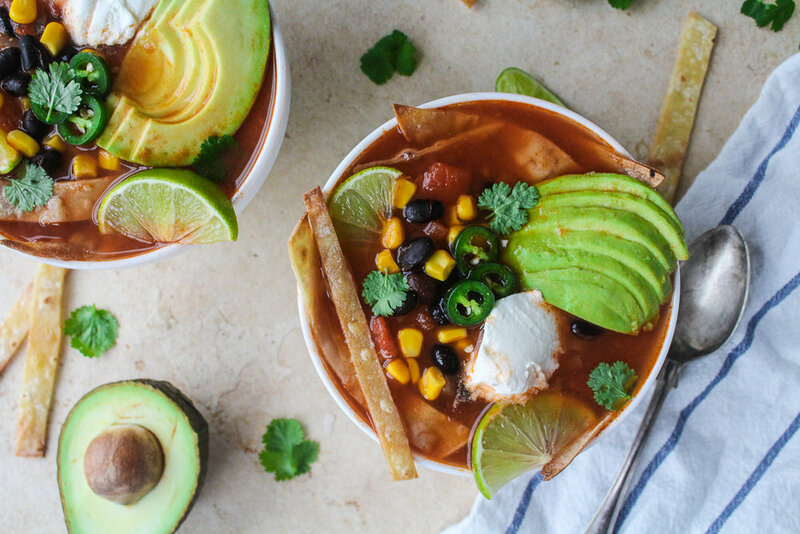 So throughout the month of January I'll be sharing my budget friendly recipes with you too. Just search #gloriousonabudget on Instagram or check in here and in the recipes section of my website. 2. Peel and finely dice the onion, and mince the garlic. 3. Place large soup pot on medium heat and pour in olive oil. Add in onion and garlic, and sauté for 5 minutes until soft. 4. Add spices and sauté for 2 minutes until fragrant. 5. Pour in the vegetable broth and canned tomatoes, bring it all to a boil and then reduce heat and simmer for 15 minutes. 7. Once soup has been simmering away, add in black beans and corn, and simmer for a further 5 minutes. Season with salt and pepper. 8. 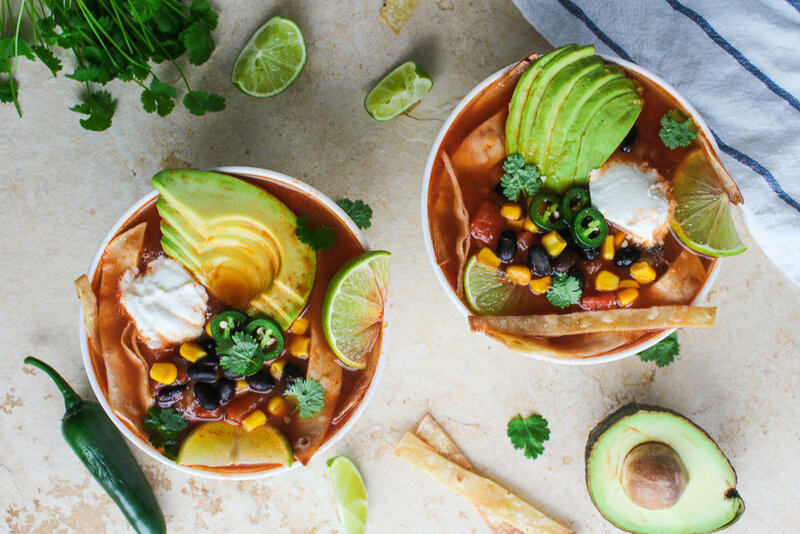 Serve soup with tortilla strips and top each bowl with sliced avocado, lime wedge, coriander, sliced jalapeno and a dollop of yogurt.